The Ulti-MATE PRO 2 Door Wall Cabinet features Unique Polyurethane Coated 3/4″ MDF Cabinet Fronts and 3/4″ Particle Wood with PVC Laminate Shells. Includes a 1″ Moisture Resistant Shelf – 200 lb Load Rating, Euro Recessed Adjustable Hinges, Over-sized Brushed Chrome Handles, and an Inverted Wall Hanging Cleat. 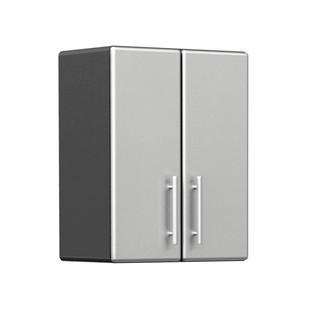 Available in rich Dark Gray tone with Metallic Silver Doors.